To those unknown heroes who have unknown battles and lie buried in unknown places. 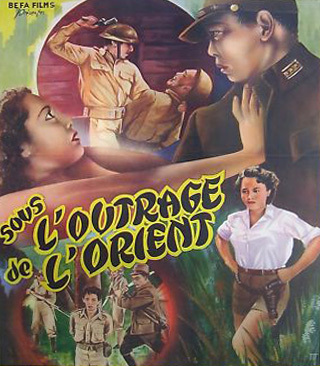 This film was also released as SUNSET OVER CORREGIDOR as well as being known as ATROCITIES OF THE ORIENT. For many years this was confused with another film from the Philippeans, BEAST OF THE EAST, which was also known as OUTRAGES OF THE ORIENT. Confused yet? It's really hard to try and lay out any sort of plot but we've basically got the Japanese taking over the Philippeans and taking their soldiers hostage. For the most part this here is a pretty interesting film because it gives you a chance to see another part of WWII. This film, as well as the other one mentioned, are very critical of the Japanese and there's no question that the films were made to remind people or to show them for the first time how evil they were during the war. There's a lot more action in this picture and that's one reason that it's more entertaining than the other. The film offers up some pretty good battle scenes considering the low-budget and there's also some exploitation style violence. The violence certainly isn't overly graphic but this film was bought and released in the United States as an exploitation picture. There's a beheading as well as some other violence but none of it is overly violent or gory. The performances are pretty good for what they are and there's no question that this will be mildly interesting to film buffs.